We are pleased to announce that our Washington, D.C. area office has moved to a new location at 4075 Wilson Boulevard, Suite 650 in Arlington, Virginia. The new downtown location is centrally located and metro accessible. About the photo above: Manhattan Construction Co. Vice President Brian Killion welcomes visitors to the company’s new Washington, D.C. area office. Learn more about subcontracting with Manhattan in the D.C. area. HOUSTON – Manhattan Construction Co. has announced that Robert “Bob” Postma has rejoined the company as vice president to lead its Houston office. Postma’s 23 years in the construction industry includes projects in the commercial office, healthcare and entertainment sectors, with a specialization in aviation work in Houston. Postma interned at Manhattan Construction in 1988 and 1989. After graduating from Texas A&M with a degree in construction science he spent the first decade of his career at Manhattan Construction. He worked at Manhattan on several major projects throughout Texas and Oklahoma including major projects in Houston at Memorial Hermann Hospital and Bush Intercontinental Airport. 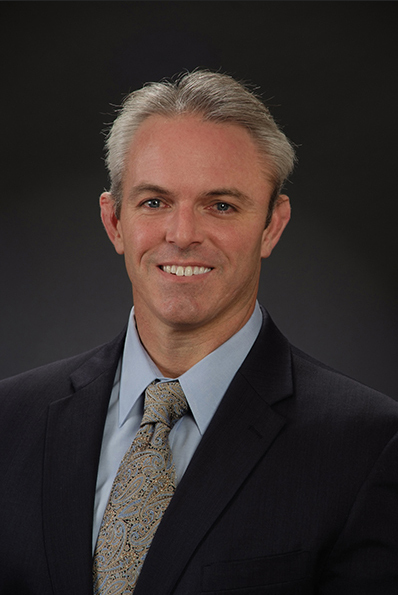 After leaving Manhattan, Postma earned his MBA from Texas A&M University and directed construction for Continental Airlines, including projects at Bush Intercontinental Airport in Houston. He then joined Skanska as an executive of their national aviation group before returning to Manhattan Construction. Manhattan Construction Co. was founded in Oklahoma in 1896 and has been a part of the Houston community since 1942. The company has constructed some of the region’s most recognized landmarks, including Ben Taub Hospital, METRO Headquarters, the George H.W. Bush Presidential Library Complex at Texas A&M, St. Luke’s Medical Towers, NRG Stadium (formerly Reliant Stadium), the University of Houston Football Stadium and BBVA Compass Stadium – home of the Houston Dynamo. In the last two years Manhattan has received more than 50 industry honors for quality and safety. Manhattan is a five-time STEP Diamond award winner. This is the Associated Builders and Contractor’s Safety Training and Evaluation Process program’s highest safety honor. The company’s services include Builder-Driven Pre-Construction®, construction management, general building, design-build and turn-key projects. The company works in the U.S., Mexico, Central America and the Caribbean. www.manhattanconstruction.com. 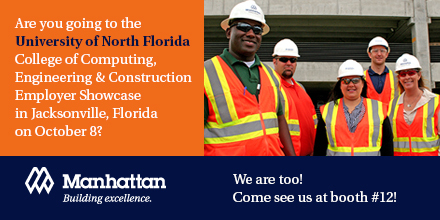 On October 28, 2014 Manhattan Construction Co. team members Steve Williams and Todd Fultz will be visiting with students at the University of Florida M.E. 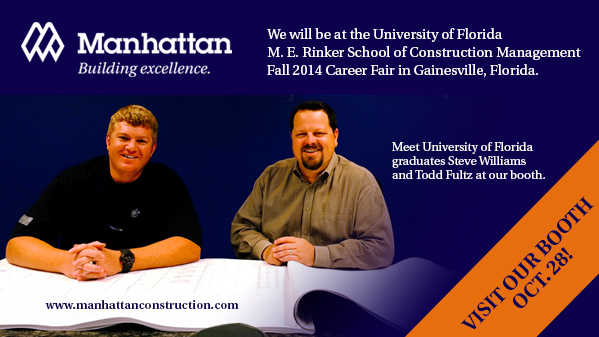 Rinker School of Construction Management Fall Career Fair in Gainesville, Florida. To learn more about working at Manhattan Construction visit our careers page. Visit this page to learn more about the career fair. We will be at the Florida International University (FIU) OHL School of Construction Fall 2014 Career Expo on October 23 at the Modesto Maidique Campus in Miami, Florida. 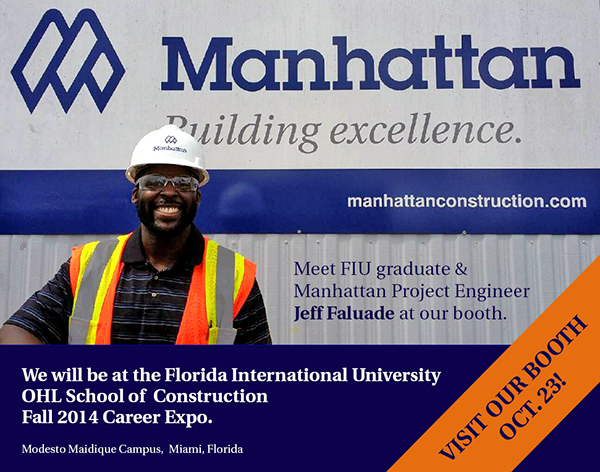 Meet FIU graduates Jeff Faluade and Jack Dillon at our booth and learn about careers at Manhattan Construction. Are you going to the University of North Florida College of Computing, Engineering and Construction Employer Showcase on October 8? Our own Scott Heddens and Todd Fultz will be there too. They would like to meet you. Stop by our booth #12 and say hello! You are currently browsing the Manhattan Construction Group blog archives for October, 2014.